Icons or symbols are an “easy” way to organize information throughout an evaluation report. I say “easy,” but I really mean easy for the reader. Symbol sets provide mental organizational structure. They often aren’t so easy for the report author, though. Usually it can be difficult to find a set of symbols through stock image sites that adequately fits the information being conveyed in the report. You’ll quickly see there’s a ton to dig through. Like the search for good images, it can often take more time than its worth to find a good match to your reporting needs. So here’s a quick way to make your own. In this example, I’m trying to compare key indicators (rates of graduation, obesity, and home ownership) between Michigan, our nemesis to the south Indiana, and the national average. This is what the typical boring table would look like, yes? I wanted to make similar-looking icons to represent each state. In the case of states, the shapes of each state could work, but purchasing state shapes via a stockphoto site was going to set me back about $30 (and think about the shape of Wyoming – would anyone really recognize it?) . Ok, I know it doesn’t do much to add icons to one table. 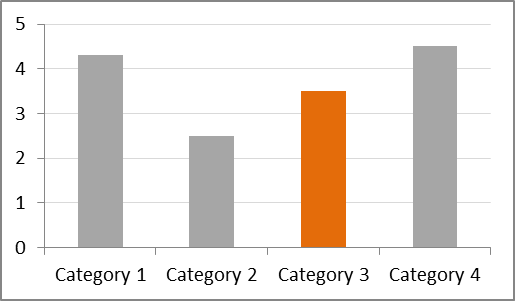 But when we use the icon system throughout the report, we build a predictable organizational structure that speeds recognition and aids comprehension. See what I mean? And I did it all without the aid of fancy graphic design software programs, with about 5 minutes of experimentation. Try it out for yourself! Enjoy! I was recently workshopping with a group of evaluators who had bravely submitted their work examples for group critique. In one instance, they had admitted that what I thought were text-heavy slides was actually a full written report. That’s right – they’d used PowerPoint for written report layout. Mind. Blown. Then I started asking around. As it turns out, this is somewhat common. People find PowerPoint immensely easier to work with, particularly in terms of arranging text and graphics, than Word. You can actually turn the orientation of your slides so that it looks more like a written report. 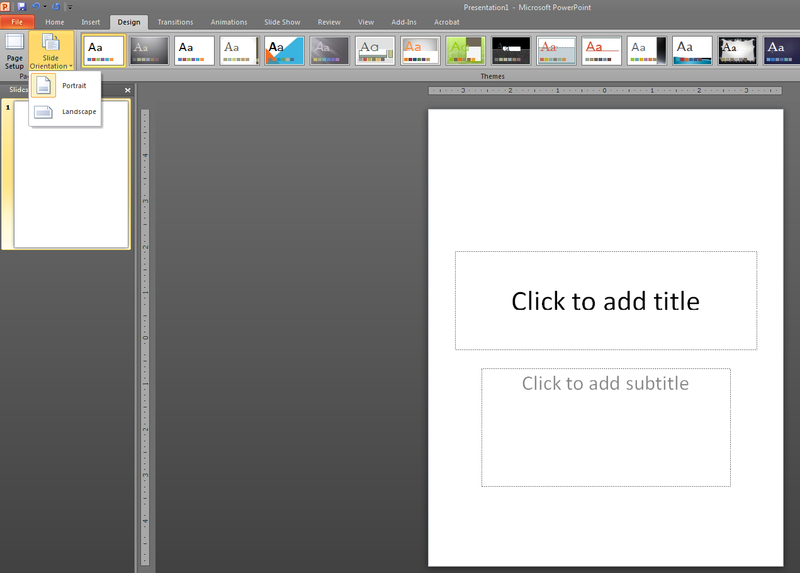 In PowerPoint 2010, this is under the Design tab, within the Slide Orientation setting. Pretty cool, eh? Why is this so important? Well, we are used to seeing slides in landscape (and the occasional chart or table) but we are used to reading long text in portrait orientation. And if we want people to be able to pay attention to what we are saying, rather than get distracted by internal questions like “Is she trying to give me a full report on PowerPoint slides?”, we have to work with the familiar. 2. Because PowerPoint works through textboxes, evaluators need to make sure the narrative text is set at an appropriate length. When our lines are longer than that (super easy to do when filling a landscape-oriented slide with a textbox), it gets difficult for the reader to track the text. Tracking the text is when a reader tries to finish one line and start the next. When the lines are too long, readers mistrack often, getting confused about which line is the next (and this interrupts comprehension and works against our intentions as evaluators). So I’ll remain agnostic about the proper software program for report writing, as long as we can agree to pay attention to the components of legibility and comprehension research wherever we are. So I made this lovely checklist of graphic design best practices as a product of my dissertation (Standing Rule: If you want to know the details of my dissertation, you’ll have to buy me a drink). It included input from a panel of graphic designers including Peter Brakeman, Christy Kloote, Chris Metzner, and Kevin Brady. Zach Gemignani, of Juice Analytics fame, gave the keynote at the AEA/CDC Summer Institute yesterday. I had followed their 30 Days to Context Connection list earlier last year, so I was super excited to witness the fun in person. His keynote speech focused on the 10 steps to becoming a Data Vizard. Yep, vizard. My favorite tip was to think like a designer. He said there’s a thin overlap of folks who are both data junkies and designers (that’s me). But those more on the data junkie side can make tiny adjustments to normal presentations that will help make a bigger impact. For example, choose one color for emphasis and use it to actually emphasize, not decorate. My hack job of his slide, illustrating this idea, is below. Another tip was about choosing the right chart. For help on that task, check out Juice Analytics’ chart chooser. It’ll guide you through your data needs and let you download a chart template for Excel that is designed for clarity and beauty. Cool! It had perhaps less than six words per slide. It had high quality graphics. It had a systematic and consistent placement of elements. But something about the presentation today still bugged the kernel of a graphic designer inside me. The presenter had clearly read some basic literature on slideshow presentations (Presentation Zen is my fave) or heard me rant about this topic in the hallways. Like many of us who are clued in to the need for better communication of evaluation topics, he totally thought he knew what he was doing. Two major issues still need to be addressed for those of us who have Graphic Design for Evaluators 101 under our belts. 2. Graphic overload. Adding more graphic elements to the presentation decreases its communication ability. If it isn’t necessary, eliminate it from the slide. Don’t put a border around it and call more attention to it. Likewise, the presentation had extraneous arrows and excessive animation. Like “chartjunk,” these elements distracted from the message. Slidejunk! I’m watching the alien genderless being wave around a dartboard, not listening to your message, my friend. When a client thinks back to your evaluation debriefing, surely it is not the silver alien you want them to be remembering. The presentation should support the speaker. While we’re probably still patting ourselves on the back for discovering the power of stock photo sites, let’s move ever upward.